Of sediments washed out by distant waves. Have caught the wind like echoes trapped in caves. Another nail for coffins perched on open graves. 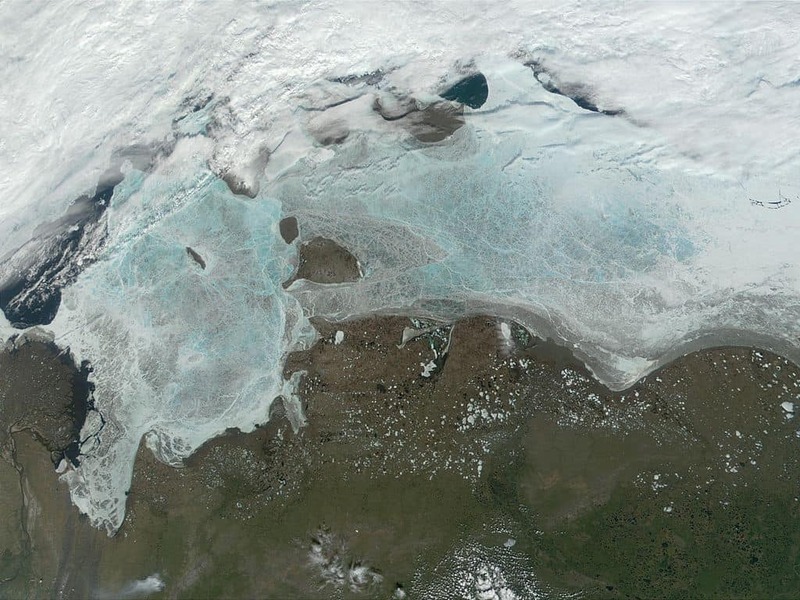 Thinning sea ice in the Laptev Sea, north of Eastern Siberia (Photo Credit: NASA). This is a Spenserian stanza, inspired by recent research which has found that the levels of radium-228 have almost doubled in a region of the Arctic Ocean over the last decade, evidence for rapid climate change in this region. Radium-228 is a naturally occurring isotope that can be used as a tracer to track the flow of material from land and sediments into the ocean. When researchers measured the radium at 69 locations from the western edge of the Arctic Ocean to the Pole on a two-month voyage in the summer of 2015 they found that that the radium-228 concentrations in the central Arctic Ocean had increased substantially since measurements had last been made in 2007. By investigating the trajectories of sea ice, they were able to determine that the excess radium came from the East Siberian Arctic Shelf in northern Russia. The East Siberian Arctic Shelf is a relatively shallow area of water with an average depth of around 50m, extending almost 1500 km off the coast of Russia. The floor of this shelf contains a large number of sediments, including radium, and this research hypothesises that climate change has caused the radium to travel from this region into the central Arctic Ocean, leading to the increased concentrations that were observed. Increasing temperatures leads to melting sea ice, which results in more open water near to the coast, creating a larger surface area over which winds can create waves. These waves can then propagate to the bottom of the shelves and stir up the sediments, which can then be transported to other regions in the Arctic Ocean. In other words, the increased measurements of radium-228 in the central Arctic Ocean are indicative of melting sea ice in the East Siberian Arctic Shelf, which itself was brought about by climate change. As well as providing further evidence for the temperature rise that is occurring in this region, monitoring these shelves is essential to understand how the changing climate will affect the chemistry of the Arctic Ocean.